This is how you start your morning when there are 2 feet of snow blowing around at 50 mph outside. First, peek out your bedroom window at 5:00am and think to yourself how wonderful snow days are. Then slide back underneath the covers and sleep in:) Next, be awakened by your children a couple hours later because the snow has barricaded the front and back doors and they can't let the dog out to go potty. Ugh! Then think to yourself how much you dislike snow days and shoveling all that white stuff. Oh well. It is a good thing I planned in advance to make sure we had all the ingredients for our snow day breakfast special--chocolate waffles. One bite of these and you'd think you were eating dessert for breakfast. Any excuse to do that is ok by me. However, if you do not have snow days to enjoy this breakfast special, then I would recommend serving these to your little sweeties on Valentine's morning. 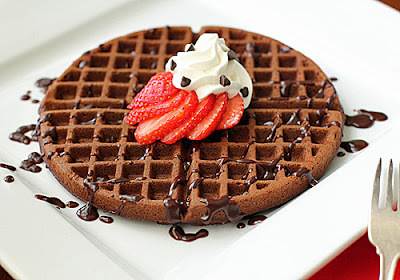 Chocolate waffles are a great way to say "I love you". Whisk flour, cocoa powder, sugar, baking powder, espresso powder and salt in a large bowl. In another bowl, whisk the milk, eggs, vanilla and melted butter until blended. Add the wet ingredients to the dry and whisk until the batter is smooth. The batter can be made 1 hour ahead left at room temperature. Heat waffle iron according to manufacturer's instructions at medium to medium-high heat. (I set mine at level 4) Spray the waffle grid with non-stick cooking spray. Pour 1/2 cup batter in the center of the iron and close. Cook until the waffles are crispy and cooked through. Carefully remove the waffle and serve immediately. Serve with mini-chocolate chips, chocolate sauce, berries, and whipped cream. Enjoy! Mmm! Those sound great. What a treat before doing all that shoveling. The waffles really did help take our minds off of all the snow!